You are GOLD | Does my bum look 40 in this? Please agree with me that it is impossible to say the word gold without the Spandau stylee "goooold" (in a hushed Kemp brother tone...) completing the sentence? I have a horrible feeling it might just be me but would love to know if there are any gold (gooooold) partners in crime? Yes today it's all about the gold. And specifically gold trainers. I know that sounds very bizarre but trust me on this.. Totally inspired by a lovely lunch with very old, very good girl friends on Saturday. One of them had the most fabulous pair of red velvet boots on but then.. out she whips a pair of simply the most superb gold New Balance. And it got me to thinking, yes I am obsessed with white, I have grown partial to a black pair but call off the dogs - let's go gold (goooold). Or metallic. I'll open up the parameters seeing as some of you may have a silver or copper leaning and I've even found some that have a nod to the theme. The one thing that there's no disputing is that trainers are here to stay. To wear with everything. Especially out suits from the other day. Simply all you need to dress them down (that and a tee which I have coming up shortly). Similar again from Mr Hilfiger. And then moving onto ones that my 13 yr old daughter HATES. Which is bizarre as these are probably (definitely) the most on trend ones here. These are growing on me. Really really growing on me. Maybe it's my new found running addiction and the fact that these look like you could break into a jog in them? I don't know - maybe I've seen them in so many places (I was drooling over them in & Other Stories at the weekend - somehow, seeing them in there always normalises things for me - does that make sense?) that they've become less "practical" and more "fashion". They do them in gold. Enough said. 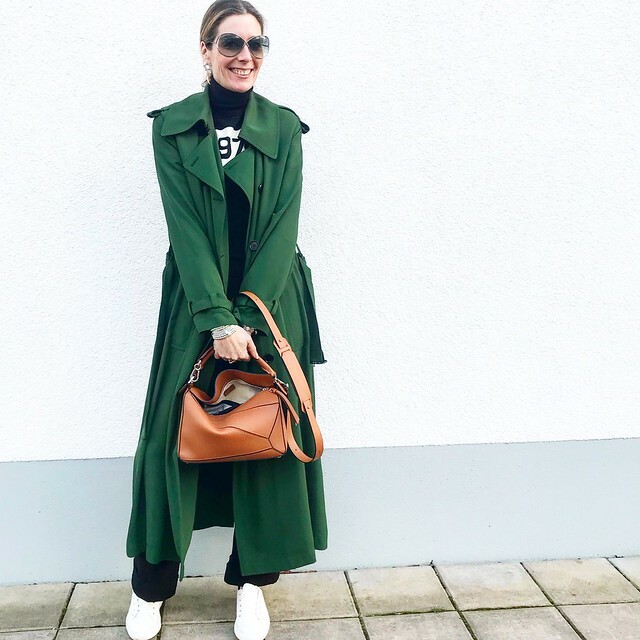 Silver at La Redoute and moving back to the style that's very much in my comfort zone. Silver at Esprit at La Redoute £49 (these look very Marant to me). 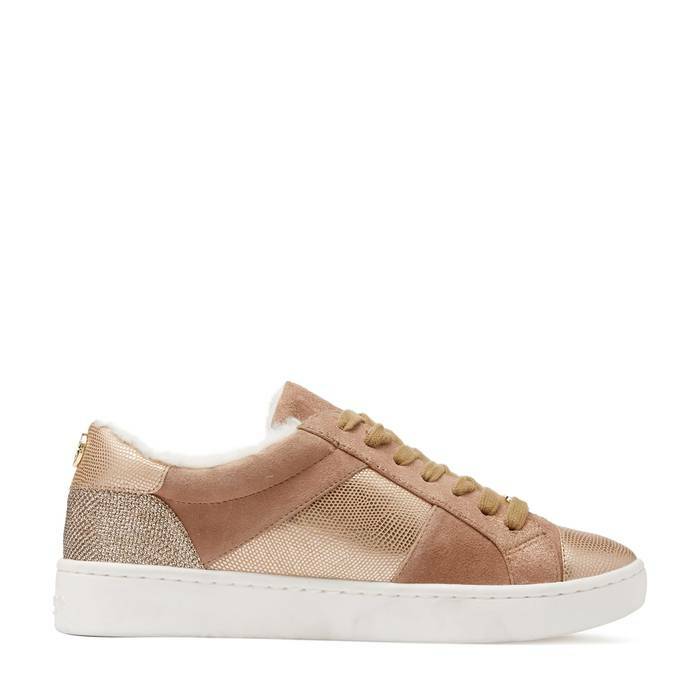 Rose gold with 70% off at La Redoute. Hint of gold at Carvela. A nod to the metallic with some rose gold. Back to the super trendy wendy (just so I sound like a PROPER old lady). So have I persuaded you to swap the white ones for a metallic number?? I have managed to convince myself that a black pair is a really good idea (although yes, I do still reach for and am drawn to the white numbers like a moth to a flame but a change is as good as a rest every now and again). Today for example - I could so easily have gone gold, couldn't I? Day of more school visits for the 11yr old, work and a run. The running is going really well (even though I say so myself and believe me, there is no one more surprised at me than that) - I have got to Week 5 of the course - lots of you over on Insta have asked if I'm using an app but no, I've joined a running club. We all go out together once a week (Saturday which is super easy) and then have homework runs to do between sessions. So this week it's 5 minutes running and 1 minute walking for forty minutes. I do use an app to time the intervals (called GymBoss) but other than that, I run with friends or just music. I am absolutely LOVING it.. although this week I have a twingey hip. Am hoping it's because I'm not used to it and nothing more sinister.... It started when I was running in my rubbish trainers and has definitely improved with the last two runs using my shiny new proper ones so fingers crossed it's something that will right itself. Tomorrow, London day for meetings and then an evening with the children. Wednesday night if I'm not working, we always try and do something - it may well be trampolining tomorrow. Although after our cheeky cinema trip last night, maybe I'll move it to Thursday. Speaking of last night, the Darkest Hour is amazing. Absolutely amazing. Gary Oldman totally steals the show - he is utterly sublime although I would personally give a special mention to Kristen Scott Thomas as Clemmie Churchill who is simply divine. Am desperately trying to make it through as many Oscar films as we can - this year I have promised the 13yr old we can stay up for an Oscar Party (party of two that is...). I have done this once before, actually in the US and I have to say, the majority of it is pretty dull with about a billion advert breaks. BUT she's determined - we're going to sleep all of the Sunday so she can stay up. I've done I Tonya, Darkest Hour and Dunkirk so have a fair few left to go (the majority of which, I'm not going to lie - don't remotely appeal. Bring me Thor 3....). But I NEED to know what you think of the gold trainers. Or do you just want another round up of the best of the white ones out there?! Yes! 'So true funny how it seems' gold (gooold) may be the new black, or even white when it comes to sneakers/trainers. Sorry, couldn't resist! I've had plenty of silver ones, but no gold ones as yet! Not surprisingly I'm drawn to the silver esprit pair, but a close second are the chunky M&S pair. May have to wait as I've just ordered two pairs - oops! Two pairs of what have you ordered?? Darkest Hour really is superb. Never knew how barking yet strong (well I knew he was strong but not the alcoholic barking bit!! Must google!) Churchill was. Revelations galore. Definitely worth seeing. Red loafery (is that a word?) 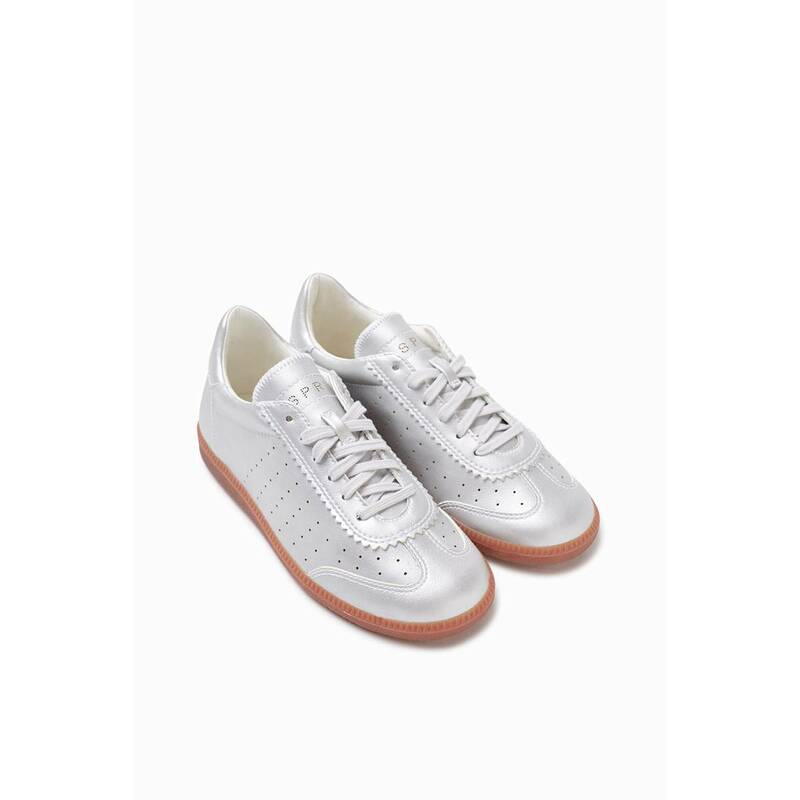 sneakers from Boden, and white nubuck Stan Smith's (planning to wear with kilties bought in the hush sale for £3). How have I not got my head around this?! I have the cheaper silver Marks ones but they are not as comfortable as trainers, they have thinner soles and squeak a bit! Still like them though and they will be fine for spring /summer! Well that's what I thought but... hmm I'm coming round to them! Much to my daughter's disgust but seeing as she has commandeered everything Stan Smith, I need another option! I have some gold converse and just bought some black with gold New Balance trainers, I don't think I have loved a pair of trainers more and they are sooo comfy! Loved your suit blog, am hoping to get a new job soon so might treat myself to the Karen Millen one if I am successful, fingers crossed! Good luck with the job!! I have tried gold trainers - I got some Asics ones a couple of years ago, but I only wore them once or twice, so I sold them on eBay. For some reason they were never my first choice (I'd always pick my burgundy Sauconys from Madewell, or one of my many pairs of Vans). Maybe silver would be a better choice, as I'm always happy to wear my grey Converse. Food for thought! And wouldn't it be a dull world if we all liked the same thing?!! Do you go barefoot in your trainers? 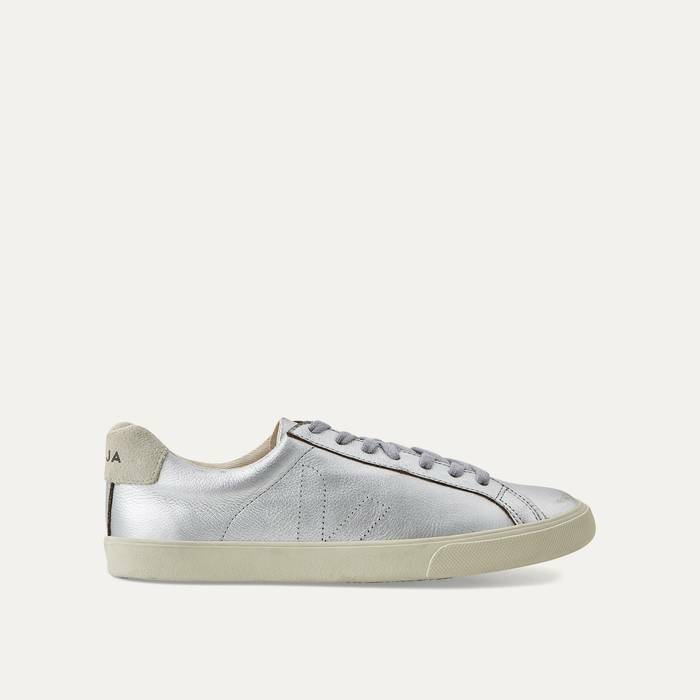 Woden do some fab metallic trainers and they are SO comfortable, great prices as well. I also LOVE my leopard trainers but I guess that’s a whole other blog isn’t it?? Ooh yes leopard! I got some custom Vans for Christmas, I went with all-over leopard print slip ons - love them! Gold is impossible to say without launching into Spandau Ballet. I have gold hi tops from Ash so I am feeling rather smug at being ahead of this trend. They are particularly cheering in this cold weather. Surely you're interested in Phantom Thread, I mean, it's fashion! I have Superga's in silver and another pair in rose gold and I LIVE in them! They go with everything. My husband refers to them as my "little girl shoes"! Oh goodness yes, my whole family would launch into gold if they word came up! I have silver shoes/trainers/skaters galore, I also have rose gold trainers but they don't get as much wear because I wear a lot of grey and so silver always seems a better fit. I wouldn't say no to gold - I do have gold loafers so it's not much of a stretch but those Esprit silver ones are gorgeous so maybe just another silver pair! Ohhhh, I love those Dune Egypt ones....and available in my size too. Mustn't buy. Have....too....many....pairs....already.